I'd been holding on to a shaker of Jake's Tri-Tip, Steak and Rib Rub for over a year, but it wasn't because I didn't want to use it. Knowing how good Jake's other products have been, I was just saving it for the right occasion. By the beginning of September I had pretty much exhausted my supply of rubs. Thus, it became "the right occasion." 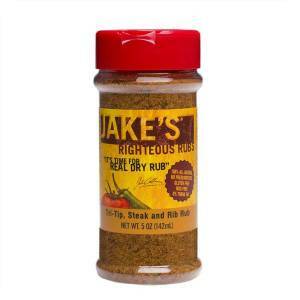 Jake's rub is described on the label as a "Premium blend of Central California Ranch style seasonings." Oddly enough, the base ingredients (paprika and brown sugar) are the standard beginnings for any BBQ rub from the Southeastern US. I also found this interesting because most beef/steak rubs start with the standard salt, pepper and garlic base. All three ingredients are featured in Jake's rub, but not as prominently as one would have guessed. Coarsely ground herbs like parsley and oregano are fairly noticeable as well. I put Jake's rub to the test thoroughly. I used it on steaks, pork shoulder, armadillo eggs and pork ribs. Though each meat was quite different and cooked using varying techniques, Jake's performed well every time. The herbs and pepper were excellent on the grilled steaks while the brown sugar melted nicely into the pork. It seems unusual to have a product work equally well on steaks and ribs, but Jake's rub managed to find that balance. 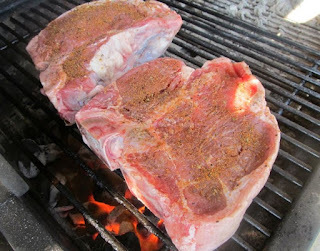 After enjoying the rub on two giant porterhouse steaks, I worried about the salt content on pork ribs. To my surprise, the salt was not overwhelming and the herbs added something a little extra that most rib rubs don't have. I would file Jake's Tri-Tip, Steak and Rib Rub under the "All Purpose" category. It's the type of rub that back yard cooks should always have on hand. 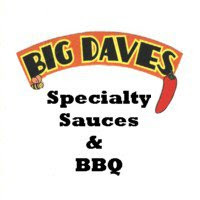 It's a versatile, high quality product that works as a flavor enhancer for just about anything. 0 Response to "Jake's Tri-Tip, Steak and Rib Rub"